You are here » Latest news / Dernières nouvelles / Laatste nieuws » 2015-04-25 » Eisner awards 2015 nominations! 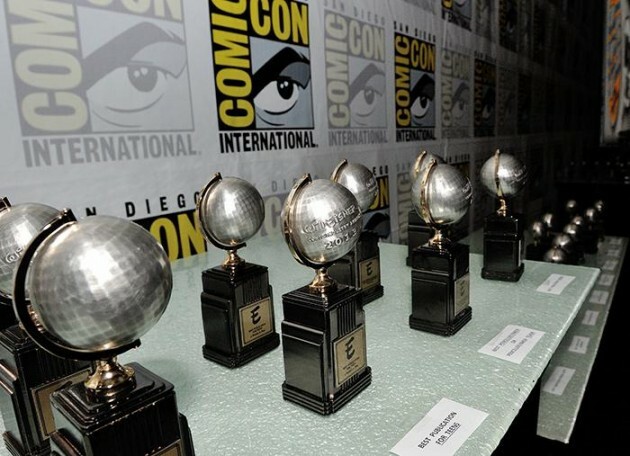 On April 22, 2015 the nominations for the Will Eisner Comic Industry Awards 2015 were announced for the awards ceremony that will take place on July 10th during San Diego Comic-Con International. The nominees, chosen by a blue-ribbon panel of judges, highlight the wide range of material being published in comics and graphic novel form today, from companies big and small, in print and on-line 1). The English translation of L'Enfant Penchée: The Leaning Girl by Alaxis Press is nominated in the category Best U.S. Edition of International Material. Also François Schuiten is nominated in the category Best Penciller/Inker 2). Named for acclaimed comics creator the Will Eisner, the awards are celebrating their 27th year of highlighting the best publications and creators in comics and graphic novels. This year the awards will be celebrating the 75th anniversary of Eisner’s classic character, The Spirit. The 2015 Eisner Awards judging panel consists of comics retailer Carr DeAngelo (Earth-2 Comics, Los Angeles, CA), librarian/educator Richard Graham (University of Nebraska–Lincoln), Eisner Award–winning author Sean Howe (Marvel Comics: The Untold Story), educator/author Susan Kirtley (Portland State University), Comic-Con International committee member Ron McFee, and writer/editor Maggie Thompson (Comic-Con’s Toucan blog, Diamond’s Scoop newsletter). This blog post was created on 2015-04-25 at 09:38 and last modified on 2018-02-11 at 09:38 by Joseph Le Perdriel.